Everyone is thinking about artificial intelligence lately—from U of T computer scientist Raquel Urtasun who recently joined Uber’s research team to the establishment of the Vector Institute, an elite Toronto-based applied research outfit, and even to our own philosopher Mark Kingwell, who has recently spoken on the ethics of AI. Now, another esteemed U of T philosopher is taking on a high-profile position in AI research. 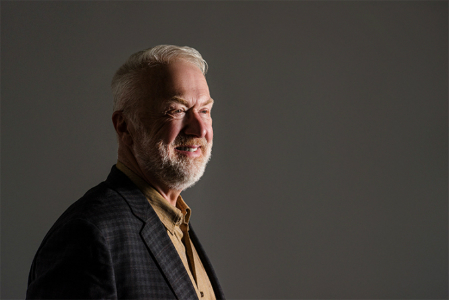 Professor Brian Cantwell Smith, specialist in cognitive science, informatics, and philosophy of language and mind, has been selected the inaugural holder of the Reid Hoffman Chair in Artificial Intelligence and the Human at U of T’s iSchool. The chair’s sponsor, Reid Hoffman, is co-founder of LinkedIn and a partner at Greylock, an influential venture capital firm; he’s “widely respected as one of Silicon Valley’s most visionary and innovative leaders,” reports U of T News. Hoffman and Smith also have a personal connection: they met at Stanford University in 1989, when Hoffman was a student in one of Smith’s courses, Philosophy of Artificial Intelligence. Can computational systems have self-knowledge? What differentiates genuine human understanding from AI? Will we be too quick to give computers roles that actually require human thought? These and related questions have been at the forefront of Smith’s ongoing research into the intersection between computation and humanity, an inquiry he will be able to explore even more deeply during his tenure as the Reid Hoffman Chair in Artificial Intelligence and the Human. Read all about Reid Hoffman and his iSchool endowment at U of T News. Read an interview about the future of AI with Brian Cantwell Smith in U of T News. The Department of Philosophy warmly congratulates Professor Cantwell Smith on this exciting appointment!